Mariotti Is Tired Of These Mother****ing Snakes In This Mother****ing Press Box! 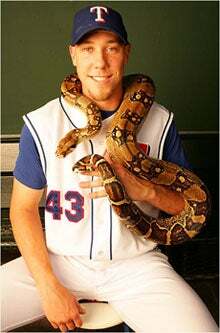 Here's one thing we love about baseball: It doesn't matter how old you are; Little League, college, majors ... everything completely and utterly stops when someone sees a snake. You could be making millions of bucks; jaded, aloof, lawyered up and possibly juiced, and it doesn't matter. "Hey man, check it out! I heard that Jake's dad got bitten by one of those and almost died! Does someone have a jar?" A 3-foot black snake sent reporters scurrying in the press box as the the New York Mets defeated the Cleveland Indians 6-5 in a spring training game on Tuesday. A grounds crew member accustomed to such occurrences at Chain of Lakes ballpark, was summoned. He grabbed the snake and released it in the parking area behind the complex.